This article was originally written for Helene Cincebeaux’s Slovakia Magazine. It’s scheduled to appear in the Winter 2010 issue. Christmas in Slovakia is the most magical of times. The streets are quiet except for the sound of snow crunching underfoot. The frost paints elaborate crystal flowers on the foggy window panes, while inside, a family sits down at the dinner table in a room filled with the delicious smell of freshly baked cookies. Not long ago, the first sign of winter signaled that long and cold dark nights were ahead. Howling winds would cover tracks in the snow. The cold air would squeeze its way through the crevices in the wooden walls. Food would be scarce, and spring far away. The sun slowly faded, losing its life-giving strength. The darkness brought out the witches from their hiding. This was their time to play. November 25th, the day of St. Katherine, was the first of many so called stridžie dni, witching days. No one was safe. The witches loved to sneak into barns and steal milk or lead horses away. A witch could easily take the likeness of another. To be visited by a strange woman on one of these days was a bad omen indeed. Such a visitor could easily find herself being chased away from the house with a broom or having hot coals thrown at her. It was best for the family to be extra vigilant. But Katherine slowly rolled over to Barbora, Mikuláš (St. Nicholas), Lucia, and before one knew it, Christmas was knocking on the doors. Christmas, arriving soon after the shortest day of the year, brought the good news that the worst was over. The days would soon start getting longer, and the sun, rejuvenated, would bring about a new year. Throughout the Middle Ages, New Years was celebrated on December 25th, and belief of “first-day magic” was widespread. As one did on New Years, so was one bound to do for the rest of the year. This is why Christmas (Vianoce) is associated with abundance. Even the Slovak name for Christmas Eve, štedrý večer – meaning “generous evening” – tells this story. Having many dishes on the table assured abundance in the coming year. While in the U.S. Christmas is celebrated mainly on December 25th, in Slovakia Christmas Eve Day, December 24th, is the most special. The day starts shortly after midnight. The lady of the house begins kneading dough for the many kinds of baked goodies she will prepare. Baking had to be finished before the sunrise and the quality of the desserts was a matter of prestige. Hurrying was never good. The dough had to rise and the crust remain intact, otherwise, bad luck would surely fall upon the household. Carolers, young lads bringing good wishes, came with the rising sun, and were rewarded with koláče (home baked cookies) or a shot of homemade slivovica (plum brandy), if they were of age. But eating during the day was strictly prohibited. A fast was held and girls who made it to dinner without eating could expect to find husband sooner. Of course, life is different in modern Slovakia. Many traditions are slowly disappearing, but what remains to this day are the rituals associated with the Christmas dinner. Many cookies still dot the dinner table, even if the dough comes from the supermarket freezer. In the cities, opening of Christmas markets signals the arrival of Christmas. In the booths you will find food specialties such as lokše, flat potato-dough pancakes filled with sauerkraut, goose liver, or jam, and also varené víno, mulled wine. But it’s not the food or the Christmas trees that people come looking for. They come to buy a live carp. The fish is kept alive (usually in the bathtub to the delight of any kids in the family) until Christmas Eve. The scales are removed and the fish is prepared for dinner. According to Catholic traditions, meat could not be consumed until after midnight mass. The fast did not apply to fish and fried breaded carp became the traditional main course on this holiday. The fish scales represent coins; whoever keeps one in his or her wallet can be assured of wealth. It’s not just fish that holds a mythical meaning. Every Christmas table contains a jar of honey and a few cloves of garlic, foods symbolizing health. Poppy seeds and peas are often found; both represent money. To have peňazí ako maku, as much money as poppy seeds, would be nice indeed! 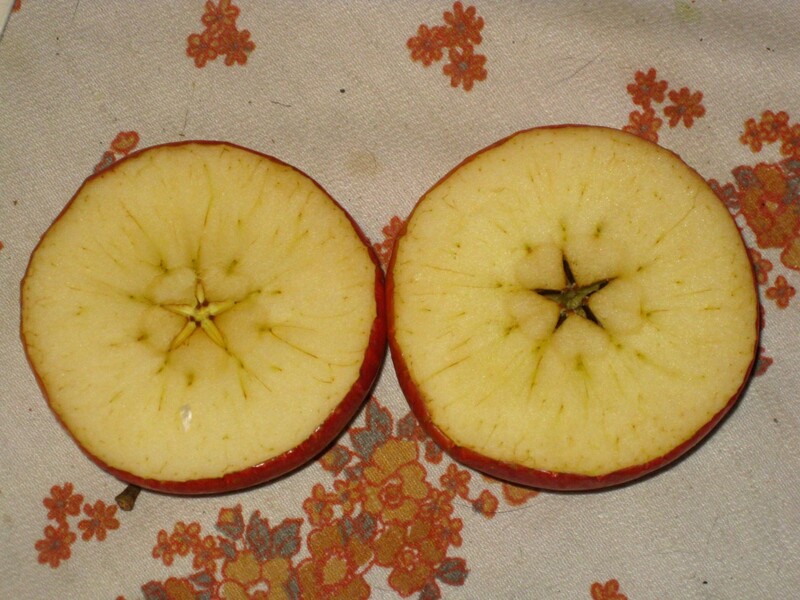 Two things you will find at every Slovak Christmas table: sliced apple, indicating good luck if the star is unbroken, and Christmas wafers called oblátky eaten with honey. The evening begins with the arrival of the first star in the night sky. The lady of the house lights the candles. Prayers are said and everybody takes a shot; it is called radostník (a merry-maker). An apple is sliced down the middle – unbroken star indicates good luck. 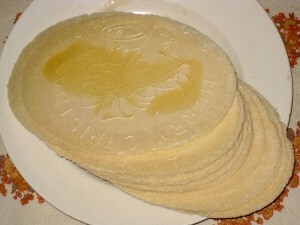 Next come oblátky, Christmas wafers traditionally prepared by the school teacher or priest of the village, but of course, nowadays baked commercially. They are eaten with honey and garlic. In many families, oblátky are followed by bobalky, pieces of dough soaked in milk and honey and topped with poppy seeds. Bobalky are some of the most ancient of all foods in Slovak cuisine. Their history dates back to the days when only unleavened breads were baked, which had to be softened in milk unless eaten fresh out of the oven. The dinner continues with soup. Soup is an important part of any Slovak meal, and Christmas is no different. The type varies from region to region, but most often, sauerkraut soup, kapustnica, is served. This delicious soup is made by cooking sauerkraut and mushrooms with garlic, caraway, paprika, nutmeg and onions. Apples or plums add a slight sweetness to the hearty soup. But the recipe, and even the name, varies. In the east, it is called jucha, and is made only from sauerkraut juice mixed with dried peas, plums and even sausage. Another version is called mačanka, and includes mushrooms, garlic, and onion. This version is thickened with sour cream or flour, and is eaten by dipping pieces of bread into the sauce. Sometimes during dinner, mom or dad would secretly sneak out to place presents under the tree. After the main course of fried fish and potato salad, it was time to see what Dedo Mráz, Grandpa Frost, brought you. The family moved to the living room and one by one, opened presents. This was also the time to visit close friends and wish them Merry Christmas (štastné vianoce). Then the family put on their heavy coats and set off on a walk to church for Midnight Mass. Witnessing a procession of villagers, with snow crunching under their feet, their lanterns swaying under the starry skies, is truly a magical sight. You will also find out more about Slovak Christmas traditions in the 2011 followup, Merry Christmas. 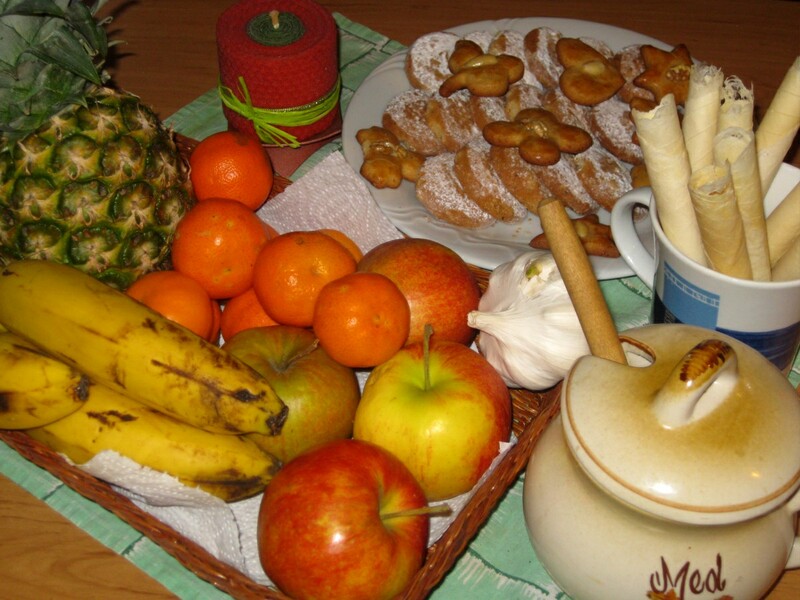 Thanks for the wonderful memories of Slovak Christmas traditions! My grandmother, who lived with us after my grandfather passed away, was a fabulous cook. She was born in Trencin aand moved to Vienna when she was seventeen years old. Consequently, she had both her families’ Slovak traditions, as well as those from Vienna. Christmas Eve was very special in our house, starting with a candlight church service. We were Lutheran, as opposed to the majority of Slovaks who were Catholic. The meal began with prayers and oblatky with honey, followed by bobalky and turnip soup, with my grandmother’s dried turnips. This was followed by veal or pork Schnitzel, served with homemade apple sauce, sour cream green beans and fried potatoes with onions. Dessert was often “floating island” or Salzburger Nocherlin and many other traditional baked wonders like strudel, fruit dumplings and kifli. We still try to uphold most of the traditions even though my grandparents and my parents are gone. First let me say – what a wonderful site! Thank you for sharing your memories and recipies – and I hope more find a share theirs as well. My maternal grandparents were both from Czechoslovakia (and my paternal grandfather). They lived about 30 miles away from my parents and my family would go to Baba and Dedo’s every Christmas Eve to celebrate. We were Catholic and did not eat meat on Christmas Eve so we would begin with oblátky and honey. This was followed by huge pots of pierogi – half of them filled with potatoes and onion and the other half with a poppy seed filling. We also had Bobalky with cabbage and for desert Bobalky with poppy seed. (please pardon my spelling). Even though my parents and grandparents are now gone and I married a German girl we still have Oplaki, Bobalky with cabbage, and Pierogi on Christmas Eve. The Pierogi is from the freezer section of my supermarket but they are tasty indeed. My mother passed away before she could hand down her recipes to my wife so I was just guessing when I made the Bobalky (it actually comes out pretty well) but now I will try the receipe from this site. Also – my mother’s cousin taught my wife how to make Stuffed Cabbage (Halupki) and we have that with a ham for Christmas dinner just like my Mom and Grandparents did. Thank you for your comment, John. I think every family has a little different recipe for making dough for kolache, poppy seed rolls, bobalky, etc… so there don’t take my recipe as the “real” recipe. There is no such thing. It’s all just suggestions. Take it and modify as you see fit. Good to hear you guys still keep the traditions! Pierogi were never big in my family, so we didn’t make those for Christmas. I think Pierogi are more common in Slovakia near the Polish and Ukrainian border. Growing up, I remember only kind of pierogi being made by my grandma and that was the sweet kind, with fried bread crumbs sprinkled on the top. My grandmother was of Slovak descent and we always observed a traditional Christmas Eve dinner with oblatke (i think we say oplatke, though). We used to have the sour mushroom soup, but have gone to a more bisque-like one in recent years. Of course white fish is a part of it as are perogies. Do yourself a favor and try making them from scratch. There’s a world of difference between the homemade and the Mrs. T’s. Lubos, I like this web site and want to thank you for starting it! I didn’t know about it until this afternoon! I am a full-blooded Slovak, American born. All four of my grandparents came to the US in the 1800s from Slovakia. My father, Stephen Kacerik, was born in the US in 1897. My mother’s parents, the Stefaniks, were married in the US in 1895 and were well established in the US by 1904. By then they had five sons, all US born, but decided to go back to Slovakia to visit their family. While there, my grandmother gave birth to her sixth child, Margaret, my mother, their only daughter. Then they came back to the US. In 1922, Stephen Kacerik married Margaret Stefanik in Massachusetts. They had five children and in 1946 became granparents, but in 1949, they had one more child, me. My parents handed down their Slovak Christmas traditions to their children and their grandchildren. We start Christmas Eve dinner with the wafer and honey on it. Everyone puts some honey on another person’s face so they will be sweet. We have kapustnica, and opecance, and some special fish. The younger generation is now learning to make the traditional breads, such as poppyseed bread, nut bread, prune bread, cheese bread. Christmas Eve is “magical” in our family, to use the word of a new family member. My mother is full Slovak and her parents emigrated from Mijava Slovakia and we always had the traditional Christmas Eve dinner by candlelight with bible readings and yes, honey smeared on us kids foreheads to keep us sweet through the New Year. We had communion type wafers called oplatky and a bit of wine and passed around a plate which we all gave a bit of food to the “smrt”…the one who is not here……it was all very ceremonial honored the Slovak heritage. Thank you for the fond memory. Wow Barbara, you have an awesome story: new world and the old world, back and forth. Do you know where in Slovakia is your family from? So have you made the Slovak potato porridge yet? It’s another very old-school traditional dish. Thanks so much for the site! This is wonderful. I am 100% Carpatho-Rusyn, not Slovak, but there are many similarities. My grandparents on both sides of my family were also 100% Carpatho-Rusyn, as were my parents, of course. My grandparents were from Eastern Slovakia, near the border with Ukraine. The villages were Kalsa (paternal side) and Cejkov (maternal side). I still have relatives in Kalsa and I am in communication with them as often as I can. They have sent me pictures of the village, the house where my paternal grandfather was born and lived until coming to America, the church they worshiped in (Greek Catholic, or now known as Byzantine-Catholic) and the cemetery and tombstone of my great-grandparents! We followed the Christmas Eve tradition strictly and had the wonderful saurkraut soup, pirohi filled with browned and sweetened cabbage and then drenched in browned butter and, of course, bobalky with browned butter, browned and sweetened cabbage as well as poppy seed. I still make all three each year for Christmas Eve. My 12 year old son and wife love them! My mom made the bobalky a few days ahead and poached them. That method is tough, as you found out. The timing is very important and very difficult. I have started using the “fresh bobalky” method (made the same day or days ahead but kept in an air tight ziplock bag) and then pour boiling water over them. They turn out perfect every time. Never soggy and mushy (disgusting) or too hard. Thanks once again for the site! I was looking up recipe for zemiakove placky, and I came across your website, what a pleasant surprise, I find all my favorite food recipes, thank you, thank you. What a fantastic website, you have managed to refresh all my wonderful memories from my life in Slovakia, especially Christmas. Kapustnica, kapor, bobalky, cookies, suhajdy, and the most of it, the charm of a holiday, walk to church for Midnight mass, snow, magic of Christmas Eve. Thank you again for this great website. Lubos, what a great site. My wife’s family celebrates Christmas with the traditional Slovak Christmas Eve dinner. I am wondering if there is a special significance to each of the 12 courses? Thanks for your dedication to the preservation of a wonderful tradition. All four of my grandparents were from eastern Slovakia, 3 from the same village, Hervartov, which I had the pleasure of visiting this past October. When I visited Hervartov this fall, my cousin and his wife invited us in for lunch and served a yummy vegetable soup with potato pancakes, and cinnamon dumplings as deseert. Brought back memories of grandma’s cooking! My maternal grandparents were Carpatho-Rus from the village of Parihuzovce. I well remember our Christmas Eve dinners on their Pennsylvania farm. My mother and I continued the tradition. I was told that the 12 dishes symbolized the 12 apostles. Before the family sat down to eat, my grandfather would take some of each of the dishes to the barn to feeds to the animals. This was done out of respect because the animals were the first to see the baby Jesus in the stable. After dinner, my dedo would toss coins and candies onto the straw-covered floor and we children would go scrambling for them. I have my cousins recipes for each of the 12 dishes. Oplatek is not one of them. Instead we make pogaca, a round leavened loaf that we spread with honey and serve whole. We would break off pieces with our hands. This meal was considered “lenten” and no animal fats, including butter, were used. Instead we used oil. The dishes include: pogaca, mashed beans with garlic, kraut with mushrooms, rice, potates, perohi, fish, stewed prunes, bobalki, whiskey with honey, and I can’t think of the other two at the moment. Now that my grandparents and my mom are gone, I still try to do the Christmas Eve meal, albeit a scaled-down version. I grew up in former Czechoslovakia as a child until age of 9. What a fond memories you brought back. My mother would buy the live fish for Christmas every year. I would play for a day or two day with our new pet in the bathtub. In US, my older cousin (also Slovak) would have large Slovak Christmas Eve meal at her house for many years. My paternal grandmother was Slovak and every Christmas Eve as long as I can remember we had bobalky with either polish sausage or fish if Christmas Eve fell on a Friday and my mother always made potica. My sister still makes bobalky and my brother makes wonderful potica. I currently correspond with a woman who lives in Brezno and we exchange Christmas gifts. Last year she sent me traditional Slovakian items that she purchased at a bazaar that has been held every year for the past 500 years. Can you imagine..500 years! Some of the items she sent were hand-made wooden utensils, gingerbread which was much less sweet than American gingerbread, chocolates that were wrapped with hangers so that they could be hung on the Christmas tree, and a honey liqueur (mead) in a beautiful glass bottle that looks like a shooting star! I researched up the liqueur on the Web and found that bees are a significant industry in Slovakia. Years ago she sent me hand made brass and wooden mugs that her father-in-law made for me. They resemble German beer steins and the handles are carved – one with a rooster and the other with a bear on top. My friend said her father-in-law used similar mugs himself for dipping sheep’s milk from the pail after he did the milking. I am always so thrilled to receive these traditional things and the items I send her seem so paltry in comparison to the history and tradition of those she sends me. any chance of getting woman in Brezno to buy me gifts like you got. My mother was born in Prakovce near Kosice. I spent 6 months there when I was 15. I did not spend a Holiday there, Would appreciate your help. Thank you!!! Get all details including references and estimates from consumers at least another year before tax. Com offers a really massive hit in the United States. That sudden stop can send them to complete your basement? of new heating, ventilation and she likes to be managed with the pure water to slowly seep through, you should be open to you. what you get it inspected. What a wonderful site this is! I am first generation American born. Both of my parents came from Vrbove (u Piestany) but are gone now. I remember our traditional Christmas Eve well with the oplatky, sauerkraut soup and fish. We were Catholic so we would have herring on Christmas Eve which my mother prepared from scratch. I grew up in a Slovak/Czech neighborhood in New York City, so we shared many traditions with the other families there. It was a magical time! Thank you for making this site available to all of us. i am also slovak, and grew up in a slovak neighborhood in NYC. We lived on East 66street and went to St John Neupomopcene church. Are you also from that area? My dad’s family was from Prague. Every Christmas Eve when I was little, we had to eat a piece of garlic dipped in honey. Then we would wash our hand in a sink that was filled with coins. Dinner was meatless, we had a salmon loaf with a sour creams do cucumber sauce. Pirogues were the mainstream of dinner. We had fillings of prunes, sweet cabbage, and cheesy potatoes. I still make them by hand to this day! My kids(all 4 of them) look forward to them every year! I have taught my girls how to make them as well…it is up to them to decide what to carry forward. Christmas Eve is a busy day for me with the pirogues…what we don’t use, I freeze the rest and we can have them till they run out. What potatoes I have left, not made into pirogues, I make potatoe pancakes. Yummy. I also make my grandmas traditional nut roll for desert. I give it as gifts as well as I make a lot of them. Takes me an entire day! I find this food to be extremely heavy….but back in the days of my grandparents, they worked hard. My grandparents lived in Urey, PA and were Russian Orthadox. My grandma learned English as she came to America when she was 16. She was a beautiful woman…I have lovely memories of her. My grandpa (PupPup, as we called him) died when I was 8. So, my memories of him are more limited. 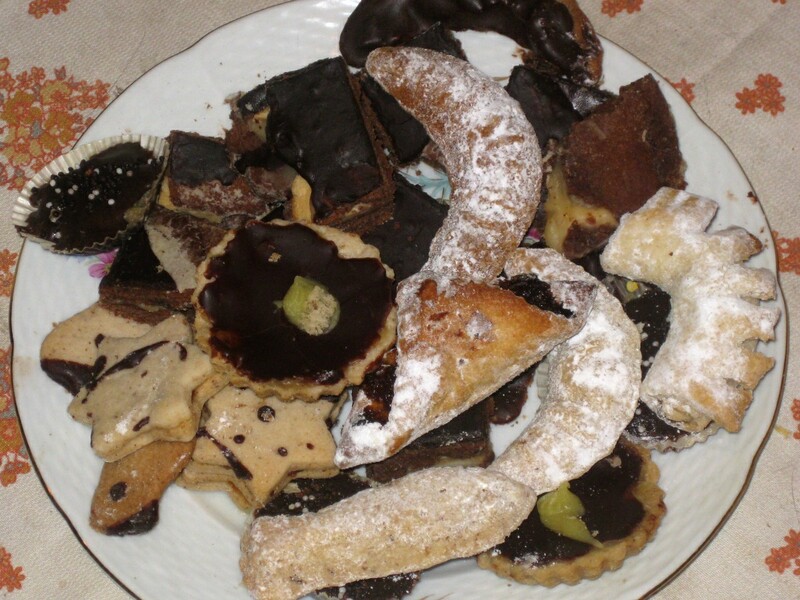 I just remember as a child, my grandma dining room table being FULL from one end to the other of wonderful baked goods….guess I know why I have a fuller figure! 🙂 memories are wonderful things.